Our classic offering: the standalone user test. Watch and listen as users navigate your website or app and describe what’s going through their minds. You’ll receive a screencap video including user interactions like mouse movements, taps, swipes, and keypresses; real-time audio captured from the user’s microphone; and written responses to a post-test survey. 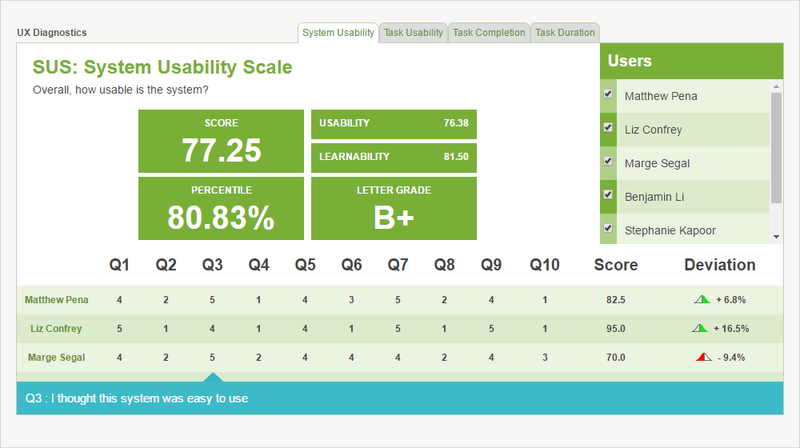 TryMyUI’s tests are completely customizable, so you get exactly the feedback you’re looking for. Describe your scenario. Designate the specific tasks you’d like to see users perform. Enter your own survey questions, or use the ones we provide. Then, select from a wide array of demographic qualifications to zero in on your target user. The user test is the cornerstone of our suite of tools for helping you optimize your product’s user experience. Give it a free try today. Test your mobile website or app to see where users get frustrated, lost, or confused. When creating a test, choose “live site” or “mobile app,” and then select the device type you want testers to use – iPhone, iPad, or all mobile devices. Our mobile testing software not only records narrated screencap video from the tester’s device, but also detects and shows interactions like taps and swipes overlaid on your video results, so you can see exactly how users are interacting with your application – without intrusive external hardware. Don’t wait until you’ve already built your product to test it! Engaging in usability research at every stage of the design process saves headaches later on, and allows you to build a better product the first time around. Whether your prototype is fully interactive, or it’s just a series of static mockups, you can test it on TryMyUI. All you need is a link so testers can access it through their browser. We’ll brief our testers in advance so they know not to expect a live, fully functioning website. First impressions are important. Add TryMyUI’s impression test to the beginning of any usability test to see what users think of your website after just 15 seconds. Before performing the tasks, users look at your website’s landing page for 15 seconds. When those 15 seconds are up, the page is hidden and they’re asked to describe the feel of the site, words they remember, products or services offered, and any other impressions. This quick test is a great tool for exploring user perceptions of your design and testing whether you’re sending the right message and setting the right tone. Written survey questions are a good way to see what users remember most about their experience after recording the test video. If an issue comes up in the written responses, especially more than once, you can bet that it’s something you should fix immediately. Create your own survey questions to add to the end of your usability test, or if you don’t know what to ask, just keep our 4 default questions. When your results come in, you can view each tester’s responses alongside their test video, or see all answers sorted by question in the “Written survey responses” section of your dashboard. Our database of thousands of testers is demographically curated to allow you to hone in on your exact target user and get the most relevant feedback for your application. Filter for traits such as gender, age, country of residence, household income, education level, employment type, family status, community type, and social networks usage to get testers like your customers. You can also list your own specific requirements and we’ll find testers who match them for you. For example, you could request attributes like: must be an avid gamer, or must have taken an overseas vacation in the last year. To filter more stringently for the user characteristics you're looking for, you can add a multiple-choice screener question to your test. Set which answers make a tester eligible to provide their feedback, and which answers disqualify them. Before the test begins, testers will respond to your screener question and continue on only if they choose an accepted answer. You may need feedback from a particular customer, client, partner, employee, or testers you’ve recruited yourself. On our Team, Agency, and Enterprise plans, you can opt to use any or all of these people as testers, instead of submitting your project to TryMyUI’s panel. Just select “I have my own testers” on the tester demographics step and then send the test URL out to your own users to perform. We understand that the products you test may contain sensitive or proprietary information and designs, especially if they haven’t been released yet. If that’s the case, you can upload non-disclosure agreements for testers to sign before they take the test to keep your materials safe and secure. The UXCrowd is a crowdsourced solution that helps you plan and prioritize your usability fixes with scaled-up insights from large tester pools. Using a weighted voting system, testers indicate their opinions on the best and worst parts of the product, creating a sorted diagnosis list that clarifies at a glance what your next steps should be. The UXCrowd makes user testing scalable – even if you run 50 tests, you’ll get every bit of insight out of them without having to watch a thousand minutes of video. It also liberates the challenge of prioritizing product problems from personal biases, allowing an objective vote-count to point the way. TryMyUI’s quantitative UX Diagnostics are a complement to the qualitative feedback of the user videos and written responses. Measure your product’s overall usability with psychometrics, and map usability fluctuations along the user’s journey with task usability scores, task completion rates, and task duration data. Psychometrics: Our psychometric surveys for measuring overall usability include SUS (the System Usability Scale) and PSSUQ (the Post-Study System Usability Questionnaire). SUS is a long-time industry standard that generates a global satisfaction score and sub-scores for usability and learnability. We use a database of scores from 500 other websites to calculate percentile rankings for SUS results. The PSSUQ survey was invented by IBM, and has more questions, a more fine-grained response scale, and sub-scores for system usefulness, information quality, and interface quality. 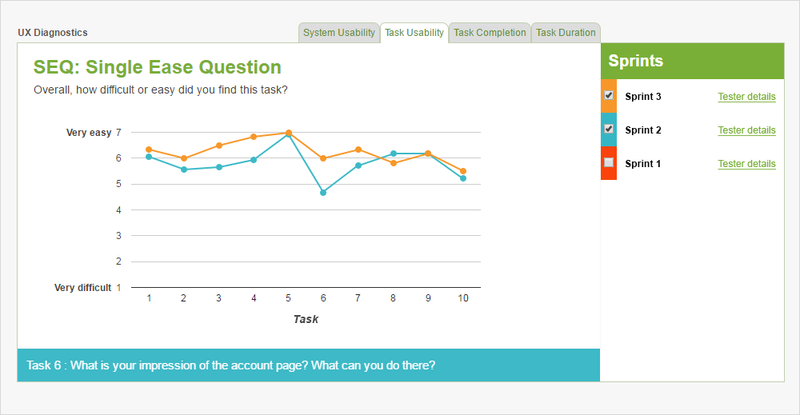 Task usability: We use the Single Ease Question (SEQ) to measure task usability. 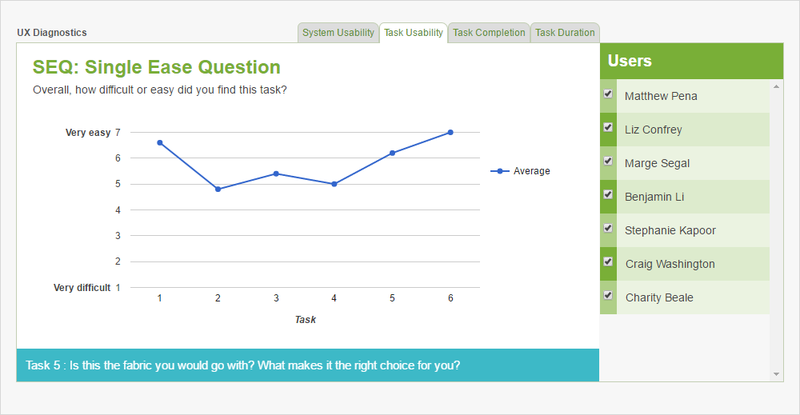 The SEQ is a simple survey designed to quantify the usability of individual tasks in a task-based usability test. After each task, the user responds to a single precisely-worded question (“Overall, how difficult or easy did you find this task?”) using a scale from 1 (Very difficult) to 7 (Very easy). Task completion & duration: See which tasks challenged users the most with task completion rate data, a simple gauge of how many testers successfully finished each task (as determined by the testers themselves), and task duration data, a measure of the average time spent by users on each task. UX Sprint enables you to do iterative usability testing that supports and builds on your design process to measure the impact of your work and point the way forward. You can run new “sprints” of your usability tests, passing the same set of tasks to a new batch of testers to perform, and then view direct metric comparisons between new and old tester results to see how the usability of your designs has changed. With our Team, Agency, and Enterprise plans, you can download your test videos and other data to view, analyze, and share it in your own way. Whether to edit or curate your videos, chop up and manipulate your quantitative data, or just to catalog your research, downloadability helps you make the most of TryMyUI’s usability testing tools. It’s all about flexibility! Analyzing user videos is a time-intensive undertaking. Our suite of collaborative analysis tools makes it quick and easy to turn usability feedback into product changes, with multi-member login, tagged and timestamped video annotations, easy-to-make highlight reels, and our templatized Executive Summary generator. Put user experience at the center of your team’s design process with unique logins for your colleagues. There’s no easier way to put user data in front of everyone from project managers to developers and designers, share critical findings, and collaboratively discuss ideas and solutions. With shared access to user tests and findings, usability research is fast enough to fit any product timeline. Create annotations with timestamps and sortable tags to bookmark the “aha” moments in your user videos. Annotations are visible to every team member, so anyone can jump to the key video highlights with one click, or quickly grasp the major issues and patterns with a look through the most common tags. Stitch together key moments from your video results to create a powerful, digestible roundup of your most important findings. Choose your clips, edit the start and end points, and then generate a video you can share with team members, stakeholders, or clients. Drag and drop annotations into our templatized Executive Summary builder to create custom reports of all your key findings, then download or present the finished product. Reports include one-click video playback straight from the user data to back up your recommendations.